I was sitting having a coffee and meal planning for the week, and I figured since I was doing all the ground work for a healthy and nutritious week, I may as well share it with you guys, right? Even if you just use one meal for your from scratch inspiration, it’s better than nothing, right? If you haven’t engaged in meal planning before, it’s pretty simple. Pick what you want to eat for the week, write a list for the grocery store, shop for what you need and get on with it 🙂 I hope you find some inspiration. Have a great week! Ok guys, let’s start the week off right. Meatless Monday with some Nutty Ginger Tamari Quinoa Salad from Bam’s Kitchen. 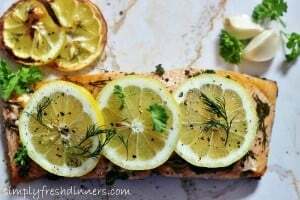 This Baked Salmon with Lemon, Dill and Parsley from Simply Fresh Dinners will be ready in twenty minutes from start to finish. Pop the chicken in the marinade before bed on Tuesday night to give this chicken a pop of flavour to die for. One Pot Chicken Fajitas from The Girl and the Kitchen is a great dish to celebrate hump day in style. It’s Friday! Yay 🙂 Let’s celebrate by having some fake-out. This Spicy Rice Noodle Salad from Omnivore’s Kitchen is quick and easy to prepare, perfect for a chilled out Friday night. Of course, if you have little ones, cut down on the spice. If you like a little meat, you can always add some grilled steak to the top. 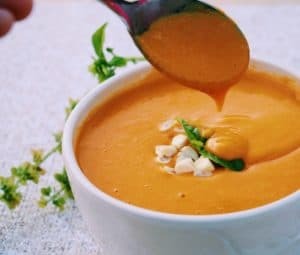 Wow… Sweet Potato and Corn Chowder sounds extremely delicious. I also love the thickness of this soup. I love the combination of ingredients. Thursdays dinner, the soup, looks so tasty! IT’s so freezing here and that sounds like it would be a great warm-up! 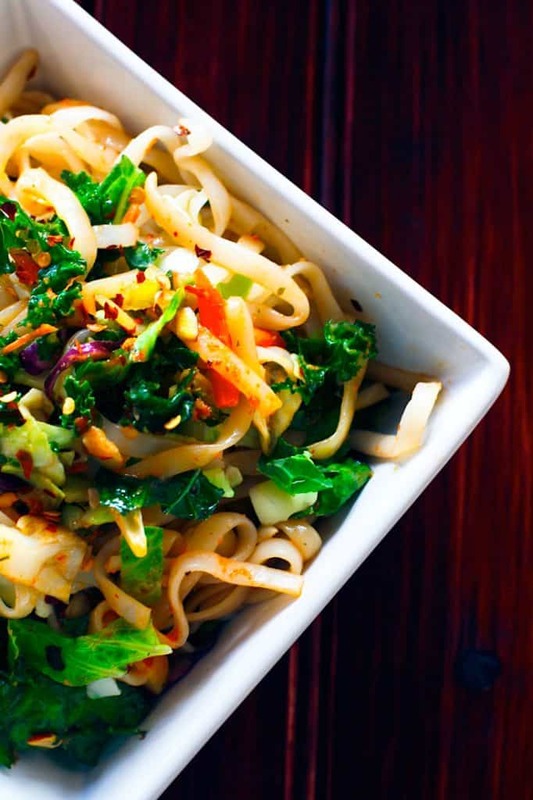 The quinoa salad and the spicy rice noodle salad look delicious! Even though it is winter, I am drawn to salads. I figure my body must be telling me to eat more veggies – and that can’t be a bad thing! Oh I totally get that Heather! I think I overdid it with the heavier meals at the start of winter, and have been craving lighter salads a lot lately too. Everything looks delicious! I don’t do meal planning, but these are great ideas. I am always looking for new ideas to prepare food. I love fajitas but I haven’t attempted them because I don’t have that sizzle pan! I am going to try to make them in the oven now. thanks! I love everything about this week’s menu! Those chicken fajitas sounds great. Thanks Michelle 🙂 The fajitas are pretty delicious! wow this week’s meals look so good. I am especially liking wednesday’s chicken dish as that is my fave to have and I eat it quite often. I am a big chicken fan as well – these fajitas are delicious!! The salmon looks delicious as does the rest of the recipes. I just wish my family wasn’t so picky. I swear my son could eat spaghetti everyday if we’d let him. I really need to start meal planning though! Oh I am so lucky mine aren’t picky eaters – it would make meal times so much more difficult (plus I do not have the patience 🙂 )! Meal planning definitely makes the weeknight dinner debacle go so much more smoothly! Oooh, your family is going to be eating so well this week! I would want to be joining y’all everyday of the week, but especially tomorrow night haha! Love the balance of fish, chicken and veggies. We just had some ah-mazing wild caught salmon last night. That’s a favorite. I ‘m going to check out the quinoa salad – looks delicious! Yum, I love wild caught Salmon – it can be hard to find around these parts, but so worth the search! 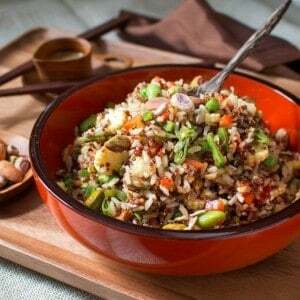 I can highly recommend the quinoa salad – it is simply delicious!! All those meals are not only delicious but so appetizing! The week meal planning is a great idea, and make the work in kitchen a lot easier in preparing and organizing. It makes such a difference hey! This is so helpful! I used to meal plan like crazy, but after having 3 kids in 4 years, I got burnt out. I feel like I’m finally ready to tackle meal planning again– I can’t wait to try the One Pot Fajitas! Oh wow, you are super woman! 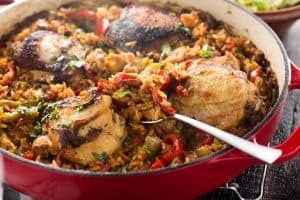 I had two in two years, and that burnt me out as well 🙂 The one pot fajitas are really delicious – both my little ones loved them, which is a huge bonus! Are you a vegetarian I am thrilled that there are recipes that cater to me to as I am a veggie. I love the sound of the sweet potato chowder and the tamari quinoa. Hey Ana, we actually aren’t vegetarian, I like to think of us as being more flexitarian….we eat vegetarian/vegan dishes maybe 5 times a week, and chicken (sometimes red meat) on the other nights. I would totally go 100% veggie, but my husband is a total carnivore, so we compromise! I am glad you could find some inspiration, it can be hard as a vegetarian, as everything can get so meat oriented these days! That would be a great idea actually, would make it a lot easier to pick meals for the week! 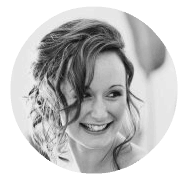 I have just finished up with this week, and I have to say, it was particularly delicious – and saved me so much time, in that I already knew what I would be doing each night! 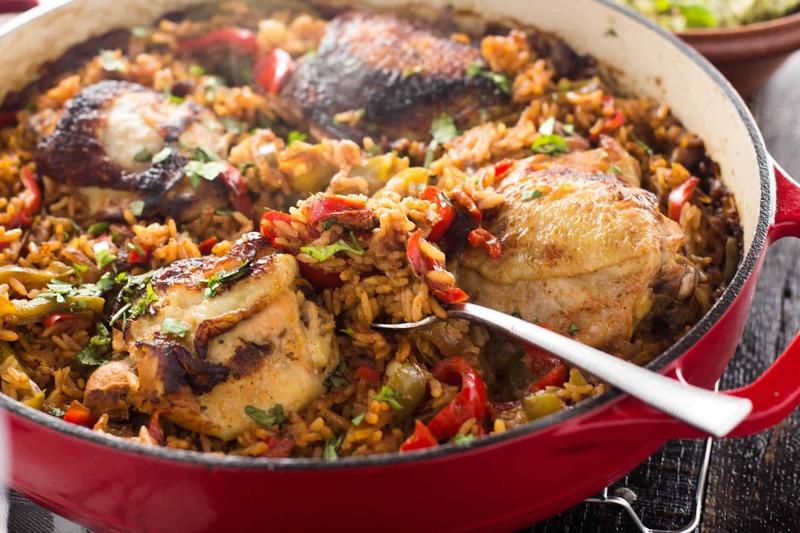 Thank you for featuring my One Pot Chicken Fajitas in your meal round up!!! Everything else looks fantastic too! Such a great meal plan for the week and starting it off with Bam’s awesome quinoa salad is the best! Thanks so much for including my salmon recipe. I love it’s simplicity. 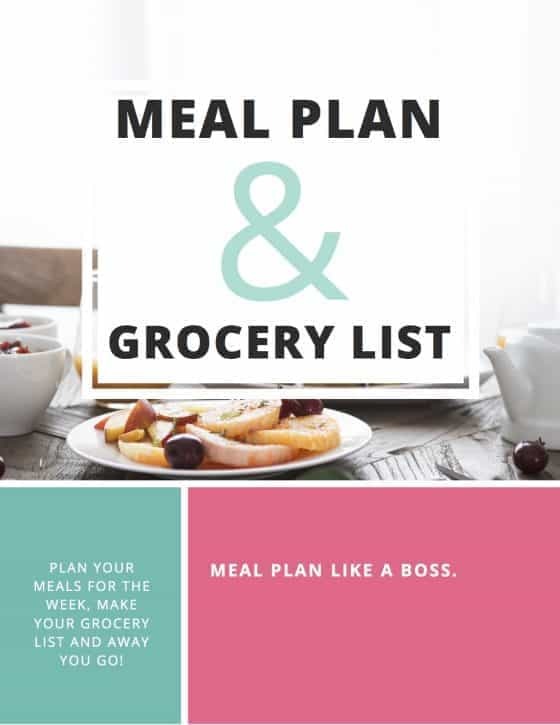 So many advantages to meal planning and I especially love the money that you can save. Looking forward to more of your ideas! Thanks Robyn 🙂 I have been looking forward to this salad for a while! My mum is arriving from Australia on Tuesday, and is obsessed with salmon, so your recipe will be the perfect welcome dish! Oh you are so welcome BAM 🙂 I have been wanting to try your salad since it popped up on my feed a few days ago, so very excited for monday night’s dinner!